Under the best conditions, the holiday season can be a difficult time for even the most stable, healthy, and psychologically well-adjusted human beings. It’s an entire span of time filled with additional responsibilities which often entail meeting the expectations of other people who may have a very different relationship with Christmas and the whole concept of family togetherness and holiday cheer. What should be a positive time of appreciating all the positive people and things in your life, often turns into an endless treadmill of stressful situations and forced obligations. For people in “recovery” who don’t have traditional families, the holidays can be a time of extreme depression, loneliness and isolation. It’s a time of the year where it can seem like everybody has a perfect life and a wonderful family, except for you. The reality is of course quite often, very different, and many individuals with big families and 101 places to go and people to meet during the holiday season, would gratefully change places with someone who doesn’t have to deal with all of that. And visa versa. No matter where you fall within the spectrum of all by yourself, way over to buried in relatives and responsibilities, it’s a good idea to prepare yourself for what’s coming, so you maintain a locus of control and can guide yourself on the path you want to follow, instead of being caught unaware by what’s coming, or using the holidays as an excuse to relapse, because this time it’ll be different, and you’re only going to do your drug of choice this one last time. Except, if you’ve been holding it together for any length of time and have gotten back up on your feet and are in the process of regaining your life… you already know that this isn’t true. During the initial stages of recovery it can seem almost impossible to go out into the world and enjoy social situations or spend time with your family and relatives, without taking some drug to alter your state of consciousness. For someone who has been taking drugs for years — or decades — to suddenly find themselves in situations you’ve never experienced while sober, can be extremely difficult. The most important thing to focus on during the Christmas season is your own state of physical and psychological well-being. If a situation is making you depressed or anxious to the point of wanting to get high just to deal with it, it’s important to put things into perspective. The holidays are a very emotional time, and if you’re not ready to deal with people or situations in your current stage of recovery, then prioritizing yourself is extremely important. It doesn’t really matter if you’re making a “big deal out of nothing” or don’t feel up to participating in some event, the truth is that nothing is ever about the event or situation itself, but rather how you feel about it. And if you’re unable to get in the holiday spirit and participate in a manner that others expect from you, then just don’t do it. Attending a Christmas party really isn’t something that’s worth jeopardizing your recovery over. Friends and family who care about you, will be understanding, and those who aren’t or can’t accept where you’re at, need to learn to deal with their own feelings and expectations without transferring them over to you and making you responsible for their happiness. 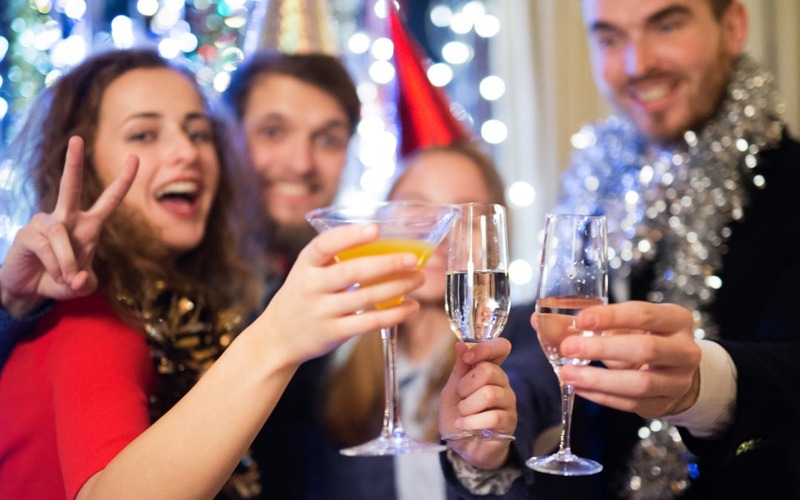 The holidays aren’t a good time to test the boundaries of your recovery program and get together with people who are still actively using drugs. It can be difficult, bordering on impossible, to find anybody at a Christmas party who doesn’t have a drink in their hand. While it’s unlikely that your host will pass around loaded syringes or base-pipes, alcohol will be pretty much everywhere, all the time. It’s important to know yourself and be honest… with yourself. If you can’t handle being in a situation where you’re around other people actively using their drugs of choice (and seemingly suffering no consequences or ill effects from their drug use), then don’t go there, and don’t spend time hanging out with these people, even if they are your friends or relatives. Your own health and state of mind, absolutely needs to come first. When you’re honoring yourself and taking the time to take care of yourself, you’re going to be in a much better headspace, than if you’re going through the motions and following the script for what other people expect from you. The holidays in general, and Christmas in particular, are all about resonating with the love within your heart. An endless checklist of parties, responsibilities, and buying mountains of junk for everybody on your Christmas list… not so much. If you can make someone else happy and meet your obligations without endangering your own well-being, then go for it, you may surprise yourself and enjoy the situation and have a good time. If all these things just stress you out, then avoid them. Having a support system is extremely important during the holidays. You need an individual whom you trust and can talk with, about whatever feelings or situations arise, and you really need some sort of group support, where you can go and talk with other people who are, or have been, where you’re at, and will understand your situation and be supportive of your choices, instead of judging or harassing you — while everybody in your life should understand that your recovery comes first, not everyone is all that well-adjusted or perfectly balanced themselves, and it’s entirely possible they may dump a lot of guilt on you instead. At the end of the day, this isn’t your problem, but it can be difficult to really know and understand that failing to meet other people’s expectations of what you should be doing, doesn’t make you a bad person. Peace, strength and success in maintaining the path you’ve chosen, to everyone trying to survive the holiday season.